Rep. Ben Chipman defeats Rep. Diane Russell and Dr. Charles Radis in a primary for the District 27 state Senate seat. Chipman got 53 percent of the vote on Tuesday, and finished with a 2-to-1 advantage over both Rep. Diane Russell and political newcomer Dr. Charles Radis, a physician who lives on Peaks Island. Russell, who had a huge fundraising advantage over her opponents, finished third with only 23 percent of the vote. Radis put in a strong showing for his first campaign with 24 percent of the vote. 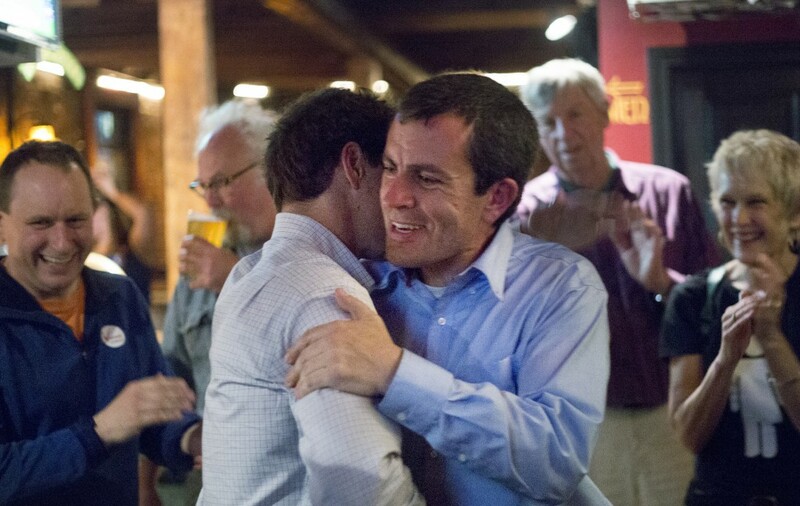 Chipman received 1,778 votes, Russell got 770 and Radis collected 797, including 219 votes from Peaks Island. Radis congratulated Chipman on his win. Russell could not be reached for comment Tuesday night, but her campaign manager said he was disappointed with the results. Nick Murray said an outside group’s negative campaigning against Chipman helped seal Russell’s fate, but wasn’t the sole reason. “Even without that we would have been down. The numbers were pretty solidly against us,” Murray said. The Democrats were vying to replace Sen. Justin Alfond, the Senate minority leader who cannot run due to term limits. Chipman will be on the ballot again in November and face Republican Mark Lockman and Green Independent Seth Baker, who were unopposed in their respective primaries. The Democratic primary became the most competitive and controversial in recent memory, primarily because the winner will be heavily favored to win in the general election. Democrats have long held the seat in the city where there are about 26,000 Democrats, compared to only 3,600 Republicans and 3,000 Greens. Russell ran an aggressive campaign, hoping to capitalize on recent national attention for her support for Sen. Bernie Sanders of Vermont in his bid for the Democratic presidential nomination and her effort to change the power of so-called super delegates in the presidential primaries. She raised far more money than Chipman and launched a slew of mailers that some said misrepresented her opponent’s positions. Through May 30, Russell had raised more than $89,700, compared to the nearly $13,000 raised by Chipman and the $12,700 raised by Radis. Russell spent heavily in the closing days, shelling out about $17,000 in the final week for direct mailers, palm cards and “persuasion calls and texts,” compared to the nearly $2,800 spent by Chipman. The mailers called out Chipman for recently switching his party affiliation from unenrolled to Democrat and criticized him for working to repeal a tax plan in 2009 that was deeply unpopular among Democrats and Republicans alike. However, Russell’s campaign characterized the tax repeal effort as opposing the expansion for Medicaid, which Chipman has supported in the past. Over the weekend, an outside group hand-delivered literature that purports to be handwritten by “a fellow District 27 voter” and claims “one of the men running for the State Senate is not worthy of our vote.” The letter does not name Chipman, but refers to a website that has information about Chipman. Russell’s campaign said Monday that it had nothing to do with the handwritten letter, but defended its mailings about Chipman’s record. Several voters interviewed at the polls Tuesday said the negative campaigning – and Alfond’s endorsement – prompted them to support Chipman. Ocean Avenue resident Virginia Bobbitt, 50, said she was turned off by the last-minute attacks against Chipman. If these were serious issues, she said they should have been discussed more vigorously during the campaign, rather than at the 11th hour. Cumberland Avenue residents Paul Ledman, 66, and Colleen Myers, 68, said they agree with many of Russell’s positions on the issues, but they were turned off by the attacks. “This campaign doesn’t reflect well on her,” Myers said, after casting her ballot at the East End Community School on North Street. Ledman said he personally called Russell’s campaign, asking if she would publicly denounce an anonymous flier. When the campaign did not indicate they would, he decided to vote for Chipman.